99% pure Tri-Methyl Glycine, an amino acid, also known as Betaine, made from beets. It does not contain Betaine Hydrochloride, found in some products claiming to be Tri-Methyl Glycine. 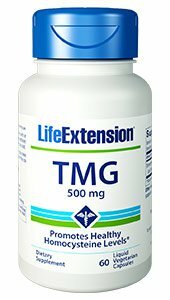 TMG is primarily recommended for liver detoxification. As a donor of three methyl groups, TMG also benefits energy, allergies, the immune response to infections, blood pressure and glucose, chronic fatigue, the nervous system (mental alertness, depression, ADD, autism), addictions, and the MTHFR defect. TMG is an anti-inflammatory, evidenced by it’s ability to decrease homocysteine, cholesterol and triglyceride levels. Take one tablet of TMG daily, with or between meals. May be taken with water or other liquids. Each bottle of LIfeExtention® has 60 capsules.